Although I’ve dabbled in meditation, I’ve never been able to extinguish the most mundane thoughts from my mind —grocery items, overdue library books, the grease stain on my favorite sweater. It wasn’t until I gave snorkeling a try in April 2012 that I fully grasped the concept of “quieting the mind”. 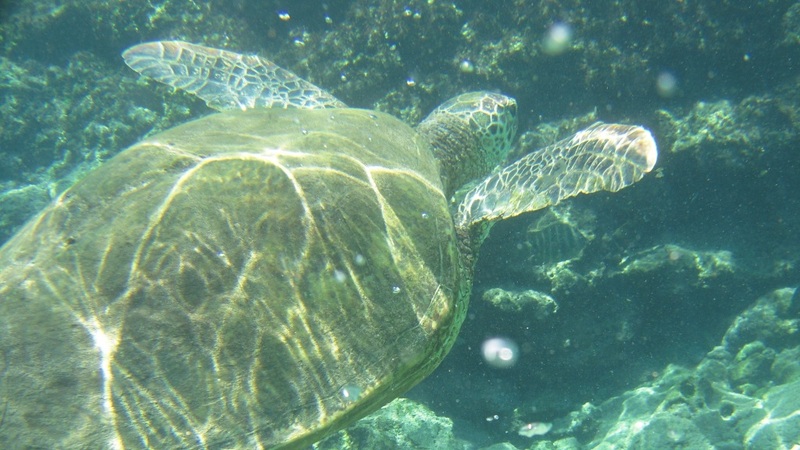 We were visiting Maui, and after a Honolua Bay sailing tour introduced us to snorkeling, we decided to try again at the popular Black Rock, just down the road from our Kaanapali Beach hotel. Along with teems of brightly colored fish, we were met there by this remarkably serene sea turtle. We knew not to seek him (her?) out or have any physical contact, but he appeared to be there by choice, unperturbed by the presence of so many snorkelers. Was it out of some kind of perverse affection for a species that wreaks havoc on his population? More likely, he was just resigned to our insidious presence. Humans have made a devastating impact on sea turtles, and they are now designated as endangered species. These beautiful creatures are caught accidentally in enormous fishing nets and hunted illegally. Their nests and mating habits are being threatened by climate change. Recent DNA analysis has shown that their genetic diversity has been significantly reduced. Our neighborhood holds its yearly garage sale in June. While our son exercises his negotiation skills selling his old toys, we sit in lawn chairs, drinking coffee and chatting with neighbors. Seems like a good deal. 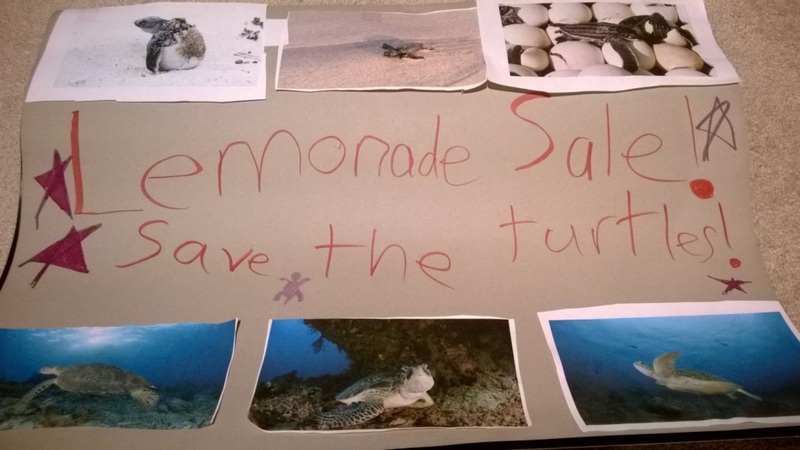 This year my daughter decided she’d take advantage of the traffic to hold a lemonade stand. As she designed the sign for her table, it was clear she hadn’t forgotten our underwater visitor back in Maui. There just may be hope for him yet. Has a travel experience had a profound impact on your child? Share! This is such a great story, and really shows how much our kids are paying attention, even when we think they are not. I wish more kids were exposed to environmental issues at a young age so that they could develop the kind of empathy that your daughter has. It’s so true that kids are paying more attention than we think. I love spontaneous moments like this that change how they see the world. Thanks for reading, Lola!